Wagner must now pass a physical before the deal becomes official. This will mark the first marquee closer the Braves have boasted since John Smoltz‘s days at the end of the pen. According to Rosenthal’s report, the one-year deal is believed to be worth $7 million and includes a $6.5 million vesting option for a second season that would kick in if Wagner closes 50 games in 2010. Wagner, 38, is coming off Tommy John Surgery in 2008 that limited him to just 17 appearances between the New York Mets and Boston Red Sox last season. The lefty showed his power arm to be intact, racking up 26 strikeouts in 15 2/3 innings of work to go along with a 1.72 ERA in 17 outings. Opponents hit just .154 against the six-time All-Star last season. During his 15-year career, spent with Houston, Philadelphia, New York and Boston, Wagner has accumulated 385 saves and stands to become just the fifth hurler in MLB history to surpass the 400 save plateau with a healthy 2010 campaign. Only John Franco (424) has more saves all-time by a southpaw pitcher. Atlanta will give Boston a supplemental first round draft pick for signing Wagner, who as a Type-A free-agent was offered arbitration by the Red Sox prior to Tuesday’s deadline. The Braves have a very good chance of recouping that draft pick loss, however, as both Rafael Soriano and Mike Gonzalez (who were also offered arbitration Tuesday) qualify as Type-A FA’s and would fetch first rounders back for Atlanta if they sign elsewhere. This is a potential signing that I believed the Braves could pursue and had highlighted it prominently in my upcoming Winter Meetings Primer entry. Of course, that piece had yet to hit the Blogosphere before news of this signing broke, but rest assured it will still make an appearance. I just won’t be able to claim any psychic connection this time around. As he did so many times as an All-Star stopper, John Smoltz closed the door on Thursday. This time, however, it was on his career with the Atlanta Braves. In many ways, it signals the end of an era and has become a lightning rod for the frustrations experienced by the Braves this winter. Unable to reach a trade for Jake Peavy, shunned by A.J. Burnett and forced to endure an embarrassing turn of events with Rafael Furcal, this off-season has been truly forgettable. The ire of Braves fans has been hard to miss, boiling over with the loss of Smoltz, a once unimaginable scenario. On Monday, fans from Red Sox Nation will see their newest acquisition introduced in a press conference. And Braves fans will see Smoltz don a new hat with a “B” rather than the classic script “A” he has worn since 1988. Smoltz was limited to just six appearances in 2008 and could be 42 before he throws his first pitch for the Red Sox. Boston is spending $5.5 million to bring the winningest pitcher in post-season history into the fray for what will likely be another October run in Beantown. What’s more is that they do not expect him to take the mound until around June 1, giving him incentives that are essentially pro-rated so that he could easily earn up to another $5 million. This is a luxury spending for a man who could make a big impact. Atlanta’s best offer of roughly $2-2.5 million with incentives could have reached $10 million according to CEO Terry McGuirk, who was “shocked” by Smoltz’s departure. Atlanta’s incentives included one rather large caveat of $5 million if Smoltz were to surpass 200 innings, but nothing for any other innings marker. In other words, the Braves were looking for Smoltz, remember at 42, to be the same pitcher he was at age 40 when he threw 205.2 innings in 2007. Even for Smoltz, that seems like a tall order coming off the shoulder surgery. Without the 200 innings logged, Atlanta’s offer would only match the guaranteed portion of his Boston contract at best. That offer may have been too little too late, since Smoltz was hoping his early December throwing session would be all the proof Atlanta would need that his health was on track to expedite negotiations. That was a month ago. Atlanta made the offer they felt was appropriate for a player of Smoltz’s age and recent injury history. Despite nearly two months to get Smoltz under contract, the two sides never approached a middle ground on the terms. His loss leaves a void that will be felt from the clubhouse, to the stands of Turner Field, to living rooms of Braves fans across the country and in the community he leaves behind. Smoltz has soldiered on for years in Atlanta. taking less money at times, moving to the bullpen, moving back to the rotation and doing everything and seemingly anything else that was asked of him over a 21-year career. In the end, General Manager Frank Wren said it came down to the Braves not wanting to rest their hopes on an aging star pitcher with a surgically repaired right shoulder. Even a phone call from Cox could not change Smoltz’s mind. Boston showed an earnest interest and got their man with a better deal than Atlanta could offer. This is a public relations nightmare for a club that is struggling to re-assert itself in the race for the National League East next season. Atlanta has built much of its marketing over the past decade and a half in part or almost completely around Smoltz, the final player who remained from the Worst-to-First ’91 squad. They have also given Smoltz all the fodder he will need to use as motivation to prove he can still perform at a very high level. Pitching in the American League East in a heightened rivalry with the new look New York Yankees will provide opportunities for Smoltz to pitch in the big game environment, where he has thrived over his career. Boston fans should be licking their chops to have a pitcher with Smoltz resume on board in a pennant race. While there may be no doubt about Smoltz being enshrined in Cooperstown wearing a Braves hat, it will certainly be odd to see him pitching for the Red Sox. Meanwhile, the Braves certainly have their work cut out for them in 2009. Veteran right-hander John Smoltz appears close to a deal with the Boston Red Sox according to MLB.com’s Mark Bowman. An announcement could come as early as Thursday. player remaining from the Braves original worst-to-first season of 1991. 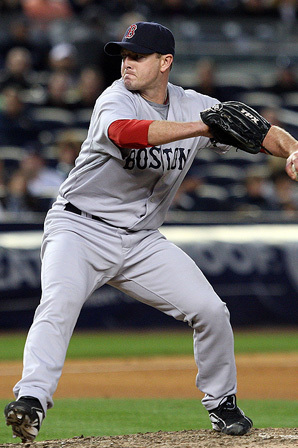 Boston would add Smoltz to an already strong rotation that includes Josh Beckett, Daisuke Matsuzaka, Jon Lester, Tim Wakefield and the recently signed Brad Penny. with reconstructive shoulder surgery. Braves manager Bobby Cox spoke highly of Smolz’s progress in rehab while at the Winter Meetings in Las Vegas. further before making a formal contract offer. Smoltz captured the Cy Young Award in 1996.
having already lost out on the bidding for free-agent starter A.J. Burnett and infielder Rafael Furcal. Atlanta general manager Frank Wren also publicly pulled out of trade negotiations with the San Diego Padres involving 2007 Cy Young winner Jake Peavy. Wren has stated on multiple occasions this off-season that he was monitoring the progress of both Smoltz and 300 game winner Tom Glavine, in hopes of bringing them back in 2009.